The project will certainly be... something. The Eagles’ season kicks off Thursday night against the Falcons, and the Birds will be without Beau Allen, who helped the team to a Super Bowl last year before signing with the Buccaneers this offseason. 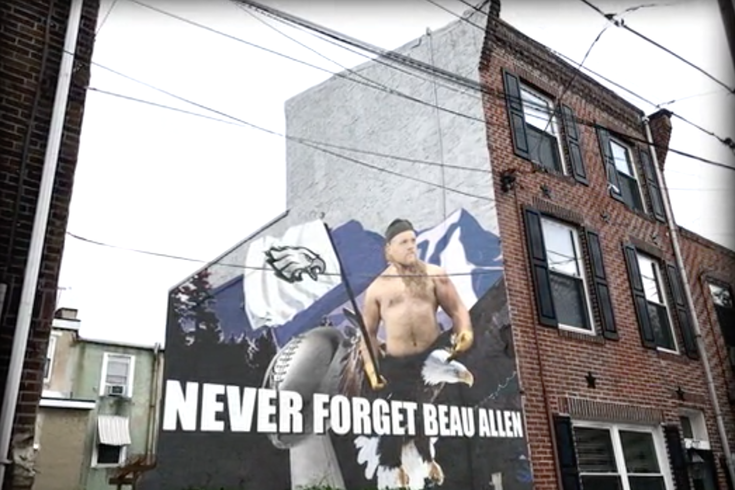 Eagles lineman and Beau Allen fan Chris Long tweeted in July that he’d like a mural in the city to remember Allen’s tenure with the team. Philadelphia just isn't the same without him, apparently. It seemed like a joke at the time, but Philadelphia artist Casey Opstad replied on Twitter and said he’d do it. So Long messaged Opstad to gauge actual interest. Then came South Philadelphia resident Patrick McKenzie, whose high school friends sent him an article about Long's tweets. "After consulting with my wife, I tweeted at Chris Long," McKenzie told PhillyVoice. "Within a half hour, he liked my tweet and forward my info on to the muralist, Casey, whom he had already been working with. According to Casey, I was the third or fourth option. Everyone else backed out when it got too real." McKenzie and his wife offered the side of his house on the 700 block of Latona for the mural. McKenzie and his wife, Lauren, own the building. The three hashed things out over Twitter, Opstad and McKenzie set a target fundraising goal of $21,000, and then, on Saturday afternoon, launched a Kickstarter. So could this really happen? “Yes, and it’s going to be beautiful,” Opstad told PhillyVoice. “I’m doing this for the greatest city in the world,” Opstad said. The Kickstarter says the goal is to have an unveiling celebration in October. If you donate $1,000, the Kickstarter guarantees you a pair of "Men's deerskin gloves with 4-inch gauntlet cuff, 5-inch fringe in the classic Western style, made of the finest deerskin from the Western U.S."
What do Long’s teammates think of all this? McKenzie said he met Carson Wentz and Zach Ertz at the opening of Wentz’s new food truck, Thy Kingdom Crumb, on Friday night and asked if they’d come to the eventual mural. “They just laughed at me,” McKenzie said. What a time to be a Philadelphia sports fan.